Make your own essential oil diffuser necklaces. So easy and so inexpensive!! 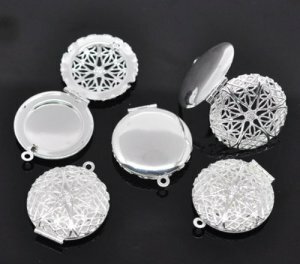 This set of 5 diffuser pendants is only $1 a piece!! You can get them by clicking on the shop now button. Combine borax and grated bar soap in a medium bowl. Pour hot water over the mixture. Whisk until the grated soap is completely melted. Allow mixture to cool on the countertop for 6-8 hours, stirring occasionally. Dish soap will gel upon standing. Transfer to a squirt bottle, and add essential oils. Shake well to combine. Depending on the specific essential oil and the situation, a total of 5-18 drops of essential oil can be added into 1 oz (30 ml) of carrier oil. These amounts vary based on the person for whom you are making the blend (see dilution percentages below) and on the strength of the specific essential oil you are using. 1% dilution = 5-6 drops of essential oil to each ounce of carrier oil or cream. This dilution is used for children, elders, chronically ill persons, and pregnant women. 2% dilution = 10-12 drops of essential oils to each ounce of carrier oil or cream. This dilution is used for massage oils for the average adult. 3% dilution= 15-18 drops of essential oil to each ounce of carrier oil or cream. This dilution is used for specific illnesses or for acute injury. After using this, my mouth feels tingly fresh for hours afterwards. No joke. I am hooked! You can add baking soda to this mix but I chose not to. As with any toothpaste, rinse and spit. Do not swallow. Blend essential oils in a 16 oz spray bottle filled with 14 oz of water and 2 oz of white vinegar. Carpal Tunnel Syndrome, often resulting in physical, emotional and financial stress, is not something that should ever be taken lightly! Restriction of work hours, loss of income, loss of movement, copious amounts of pain are some of the things that people all around the world are experiencing today due to this debilitating condition. On top of this, the synthetic drugs that are prescribed will often cause side effects on the bodies organs resulting in further prescribed medication! Fortunately there is a blend of Essential Oils that can be extremely effective! Combine Oils above into a blend and apply 1 or 2 drops to the wrist area 2 to 3 times daily where the irritation is coming from. Always mix essential oils with a carrier oil when applying onto skin. Essential oils are not for consumption. A few drops into the bathwater will enhance your bathing experience. Avoid citrus oils, cinnamon, peppermint, anise, fennel and basil in the bathwater. Avoid bergamot, lemon, orange, lemon verbena, cumin, angelica, and lime before sun exposure. There are some essential oils that are safe in pregnancy and on children, but it is better to error on the cautious side. Check safety of oils first before using if pregnant, nursing, or for use on children. Never use oils with a high phenol content for more then 10 to 12 days, which includes thyme, oregano, savory, clove, caraway, cinnamon, and bay. Never use more then a 3 % solution. Do not use on children. Use essential oils that are high in ketones with caution as they can cause liver toxicity and have a cumulative effect if used repeatedly. A normal person can metabolize 5 drops of high-ketone essential oil every 24 hours. Especially do not use these oils on children. These oils include rosemary, thuja, hyssop, mugwort, and cumin. Aromatherapy can have a therapeutic effect on the body. The information written on this page has not been evaluated by the Food and Drug Administration. The statements made represent the author's personal opinions and are not intended to replace the services of a doctor or a qualified health care professional. The information on this site is not intended to diagnose, treat, cure, or prevent any disease.